The month of May is National Electrical Safety Month. It serves as a foundation to educate people about the steps that can be taken to reduce the number of electrically-related fires, fatalities, injuries, and property loss. For our union, Electric Safety is paramount. According to OSHA, following proper lockout/tagout procedures prevents an estimated 120 fatalities and 50,000 injuries each year. 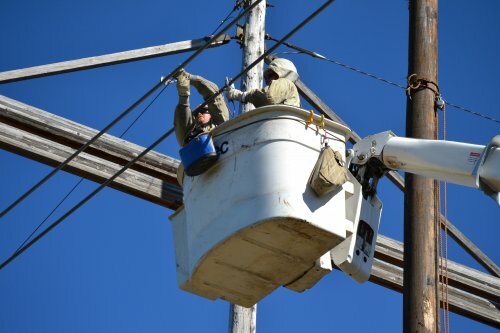 Electricity ranks sixth among all causes of occupational injury in the United States. Currently, fewer than 200 people die annually from household electrocutions. Nearly one-half of U.S. families never test their GFCIs. The Electrical Safety Foundation reminds consumers that taking steps to eliminate electrical safety threats around the home and workplace can prevents thousands of injuries and hundreds of deaths each year. Wiring hazards are both a major cause of electrocutions and home fires. The misuse of surge suppressors, power strips and extension cords is also a cause of electrocutions and fires. Add protection by installing a new electrical safety device—an arc fault circuit interrupter (AFCI)—to detect and stop electrical arcs that can cause fires. Arcs are not detected by most breakers and fuses. Use ground fault circuit interrupter (GFCI) protection when working where water is near electricity to protect against electric shock.